So excited to release our NEWEST collection for summer 2017! Our very own signature SHARKSKIN digitally printed HI brazilian cut hipster boutique bikini pant with REEF KNOT strap detail. This unique #maneaterSTYLE is constructed from the highest quality WHITE SHINY poly elastane with signature MissManeater ARTWORK digitally printed. You will NOT find this SHARKskin print anywhere else....we made it right here! Made with LOVE in Australia! Not a print girl....then what about our HIGH quality WHITE SHINY nylon lycra designer swimsuit?!?! Our WHITE style is double lined on the front of the pant to ensure it is not see through when wet. 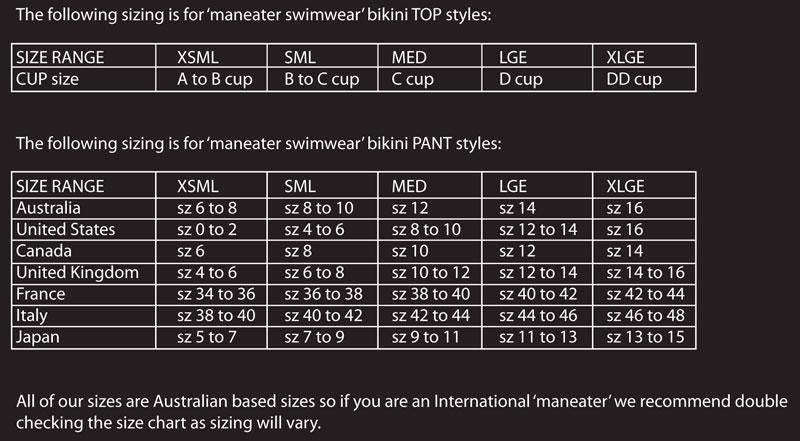 All MissManeater designer swimsuits + boutique bikinis are of the HIGHEST make & quality! Because we are Australian MADE! The BEST make! We are SUPER passionate about our sealife & our world & with Sea Shepherd having to scale back their protection of the whales...its TIME for our generation to take a stand! 11% of sales from the SHARKskin collection will go directly to Sea Shepherd Australia! Created in Australia with LOVE! Shipped GLOBALLY from Australia with LOVE!